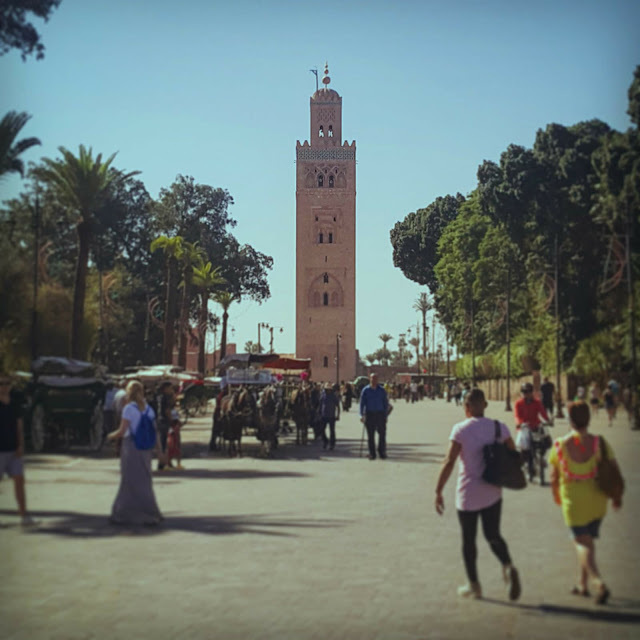 Morocco, or more specifically, Marrakesh had been on my travel wish list for years due to romantic films such as Casablanca, and television romanticising of the souks, camels and the smell of hundreds upon hundreds of spices. So when my trip to Cuba was cancelled due to the tragedy of hurricane Irma, I quickly searched for a last minute, fairly cheap holiday to fill the gap. A toss up between a relaxing beach holiday, or a backpacking, exploring holiday as this is what I'm used to, was thrown up in the air. In the end I settled for a relaxing holiday but in Marrakesh, all bundled up into a package holiday, a type of holiday I hadn't encountered since I was 15 going to Cyprus for the third time with my parents. Package holiday discussions are all for another blog, as I could rant about those for days. 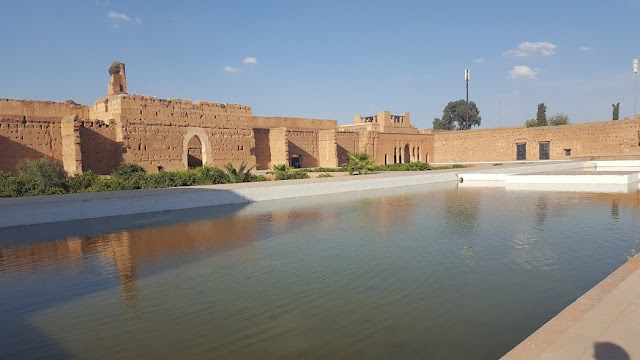 Instead, I will explore the wonders, and albeit it, disappointments of Marrakesh and how my longing for this country for many years, was quite frankly a bit of a let down. I stayed in Palmeraie, in my package holiday bubble, but spent the majority of my time in the Medina and parts of Hivernage. 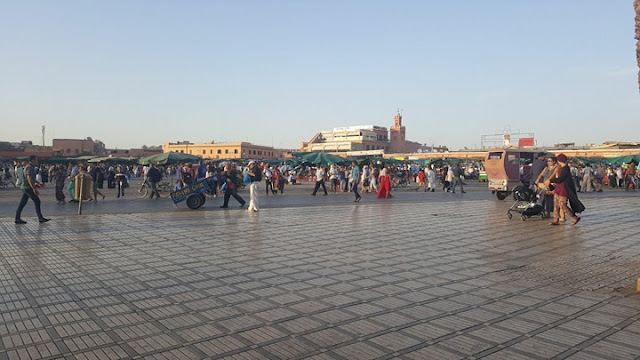 No doubt where most backpackers spend their time as this is where you can explore the hustle and bustle of the souks, the main architectural sights and of course, the famous city square Djemaa el Fna. Take note of the Koutoubia Mosque just at the head of the avenue leading to the main square. 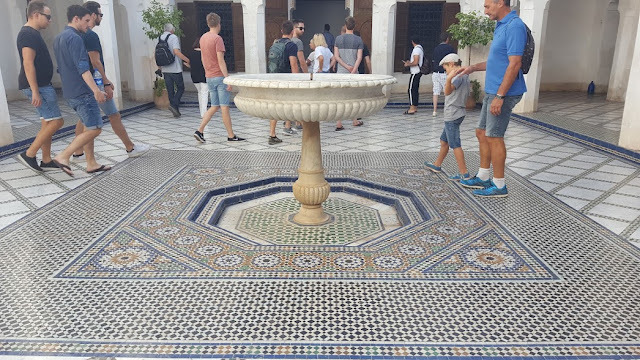 This is a tall focal point and may help you find your way back whenever lost in Marrakesh. But before you get lost, you obviously need to know where to start. I'd recommend starting at the Djemaa el Fna and take in the sights of snake charmers, henna tattoo artists and general Moroccan culture. Watching the treats is fine but if you take a photo nearby, then be warned that the vendors and likes of snake charmers, may want a few coins. Also, I never encountered pickpockets, I was told to be weary them around the square and souks. From the Djemaa El Fna you can enter the souks and get lost for a few days. I did hear of maps of the souks but it really is pointless, as only a local would be able to navigate this maze. However, certain parts of the souks are separated into different sections, for example the spice bazaars, olive souks, pottery souks and textile souks. Overall, the bazaars are difficult to get around and you may come across the same kind of stall a million times over. Ones that sell general Morocco crockery and pottery seemed to appear on every other stall, and all were wanting you to come in and haggle on a price for a Morocco jug. I couldn't really differentiate between the various sections, but apparently they are there? Take a break from the souks if you can and head to the cafes that are intertwined within it. A popular spot is Cafe Des Epices which is on a nice terrace and more aimed at tourist prices but the food and spot was good. If you have the effort, trail all the way through the souks to north of the Medina and you can hit up the Ben Youssef Mosque and the Marrakesh Museum. Both can be accessed by a single ticket and the mosque was alright in my opinion, but I'd say the museum is more worth your time. The Jewish section Mellah, and the royal quarter Kasbah are right next to each other and are just south of the Medina, so easy enough to walk, even with my pale northern skin. 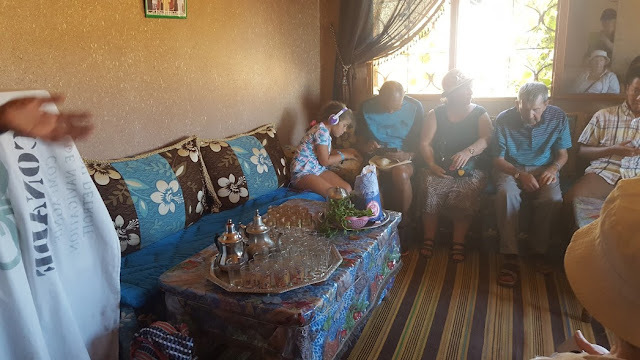 Mellah is worth a day of your time to explore all of the great sights here and you'll find it a little less (just a little) hectic than the Medina. 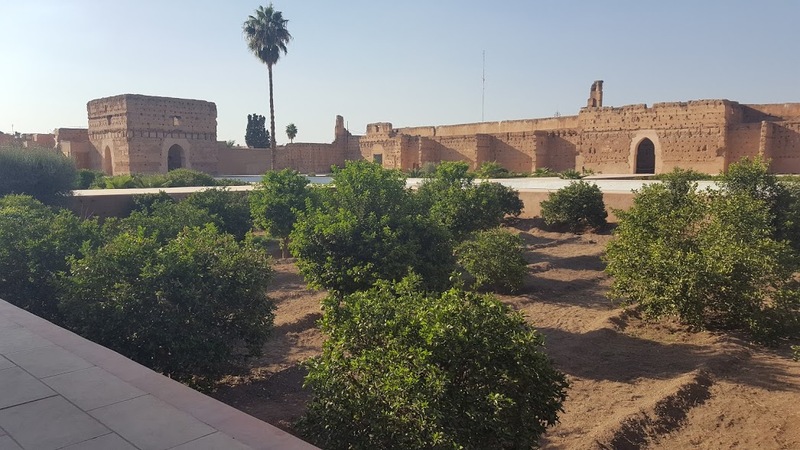 I headed to the Saadian Tombs, which were only a few pounds to get in. Not that much to see to be honest, but a beautiful garden full of nice tiles which I'm obsessed with as a new home owner these days. From the tombs you can make your way to El Badi Palace which I think was one of my favourite sights from the city. A huge former palace, which is actually pretty empty but it's size and decorative pools make it worth a visit, plus it allows you to see some of the best views over the city. Finally make your way over to Bahia Palace, which is another former palace and also another sight to behold, but behold it with a million and one other tourists. That is all I got to see in the south of the city but you can branch out either further to the Bab Djedid olive grove and the Miaara Jewish cemetery. Hivernage was sold to me as the new part of the city where all the nightlife happens, full of restaurants, bars, cafes and expensive hotels. Situated around Avenue Mohammed V you will find lots of establishments but overall I was disappointed. I expected a busy nightlife area but it just seemed like a main road with a few cafes lining the streets. Also, as an ignorant drunk Brit, I found it difficult to find a place that sold alcohol here, which I know is the custom in Marrakesh but I feel that I was mis-sold this hip, happening new town. But you can find decent Moroccan food here for reasonable prices, and I tried La Taverne which I heard was one of the oldest restaurants in the city. Whether that's true or not, I have no idea. Overall, if you're short of time then you can miss out Hivernage, but it is an alright place for a cup of mint tea. This is the commercial centre of Marrakesh, but not the commercial centre that may attract backpackers. More for your locals in terms of needing appliances, post offices and that sort of thing. The only sight that will be worth your time here is the Majorelle Gardens, the famous garden owned by Yves Saint Laurent. A bit out of the way to everywhere else but worth a few hours of your time to explore a tranquil part of the city that you won't really find anywhere else in this tourist hotspot. Overall, my views of Marrakesh are not what I would like them to be. 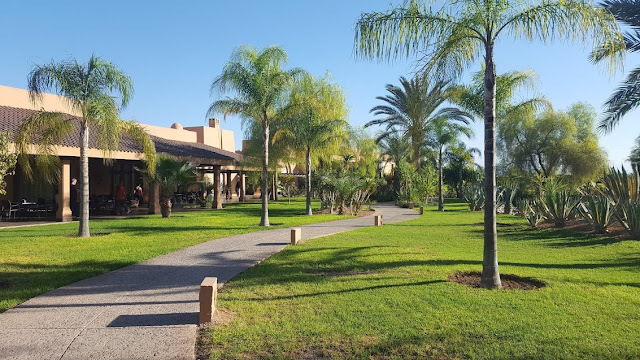 Perhaps I was a bit jaded because I did spend my time in a resort hotel in the Palmerie area and going from the relaxation of a quiet pool, to the heat and crowds of Marrakesh was perhaps too much of a contrast. This is a cool city but I imagined it to be a lot cooler. I expected smells of spices all over the city and locals haggling bargains amongst one another, but I didn't experience anything close to this. I would recommend staying more central and being a bit more backpackery than I was by staying in a Riad, but when it's more than 30°c at the end of October, then can you blame me for wanting to sit by a pool all day?